The government of Japan has provided grant assistance worth more than 1.9 billion kip (US$223,114) to support a project dedicated to agricultural and natural resource management in Savannakhet province. Russian mine clearance specialists are set to complete their demining tasks in Laos on March 15 and hand over all equipment and personal protective gear to their Lao partners, the Russian Defense Ministry said. Officials from National Mekong Committees and line agencies of Cambodia and Lao PDR last week agreed on joint actions of key priorities for a joint project on cross-border water resource development and management between Cambodia (Stung Treng) and Lao PDR (Champasak). Jo Bounmy Group, a leading business conglomerate in Laos, has approved additional capital of US$500 million to build a trade and warehouse complex at the Thakhaek Specific Economic Zone (TSEZ) in Khammuan province. The government of Japan will provide 850 million yen (about US$7.6 million) for Laos in support of activities to help communities around the country that were hit by floods last year. Three Lao workers trapped last week by a landslide while digging a passage to divert creek water to a nearby dam were found dead this week, with a fourth worker badly hurt, sources in the country say. In the olden days, women across Lao inherited their weaving skills from their mothers, mostly for their own use. Representatives of development partners, line departments of the Ministry of Health and target provinces met yesterday in Vientiane to finalise plans for maternal and child health care for this year and next. A Singapore non-governmental organisation (NGO), Radion International, will support child protection and development in Laos. At dawn on June 28, 2018, two men with a backpack trek through a forest near the Vietnam-Laos border in Nghe An Province. The cabinet has instructed the Ministry of Finance and other state agencies to collect at least 20 percent of total revenue targeted for 2019 by the end of this month. The Mekong River is a source of water for millions, the world’s most productive freshwater fishery, and a lifeline shared by people of five nations. 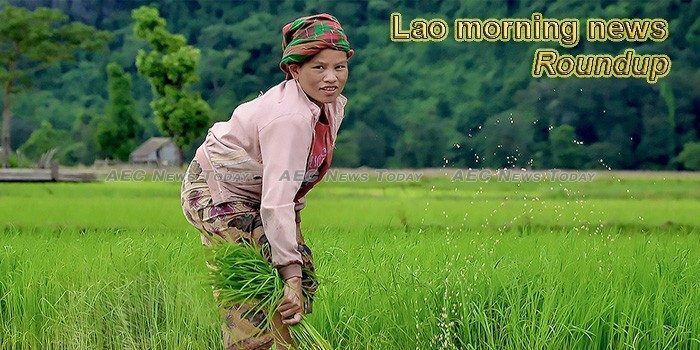 Vientiane authorities have frozen land sales and transfers in Dongdok village and surrounding areas after the National University of Laos filed a claim stating that it had the legal right to own and regulate the area. The European Union (EU) must demand the Lao government release detained government critics, investigate all cases of enforced disappearances, and provide adequate compensation to victims of land confiscation and survivors of a recent dam disaster, FIDH and its member organization Lao Movement for Human Rights (LMHR) said today. The National Puppet Theatre Troupe showcased their puppetry skills in a fitting fun-filled family show on Wednesday to mark the 35th anniversary of the establishment of Borikhamxay province. This International Women’s Day, the Australian Embassy in Laos is highlighting the role of sport in promoting gender equality and women’s empowerment by hosting a panel discussion with representatives of the Australian National U16s Women’s Football Team “the Junior Matildas” and the Lao Football Federation in Vientiane. Village authorities will spread the word about the need to eliminate violence against women, hoping to change attitudes and put a stop to the abuse of women and girls. Prime Minister Thongloun Sisoulith will lead a high-level Lao delegation to visit Hungary and Germany from March 9-14 to enhance the long-standing friendly relations and cooperation between Laos and Hungary and between Laos and Germany.